The perfect tool for suspending a crucible. 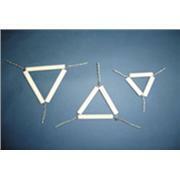 The uniform clay tubes supports the crucible and the galvanized iron wire resists rusting. 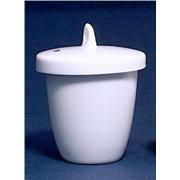 A high quality porcelain crucible. The porcelain is uniform in thickness and dense which allows stable mechanical strength and little permeability. When properly used, the glazed pieces can withstand temperatures of 1050 degrees centigrade. The crucibles are glazed on the inside and outside surface.